Between your kids, pets, and everything else, your carpet takes a beating. Unfortunately, the commercial carpet cleaners that you can purchase at the store can leave your house smelling for hours after you’ve cleaned up the spill. Plus, many of them contain harsh chemicals that can damage your furniture, carpets, and curtains. When you have severe stains on your carpet, you can make a DIY carpet stain remover that is easy on your wallet and won’t leave harsh chemicals behind. Here are several homemade carpet stain remover recipes that are simple to make using everyday household products that you might already have in your kitchen and bathroom. When you are dealing with stains in your carpet, the last thing you want to do is have to call a professional cleaner every couple of months to deal with the problem as this can get very expensive. So, here are some great homemade spot remover recipes you can use in between professional cleanings to keep your carpet smell fresh and give it a new look. Making an effective homemade carpet cleaner is extremely easy to do. It performs just as well as the carpet cleaners that you can find at the store. Containing natural ingredients that can be found in any supermarket, these cleaners are less expensive than the commercial cleaners and are safer for your family and the environment. When you have spills and tough stains to treat on your carpet, a homemade spot remover is a way to go. Everything in this recipe is something you probably have in your pantry. 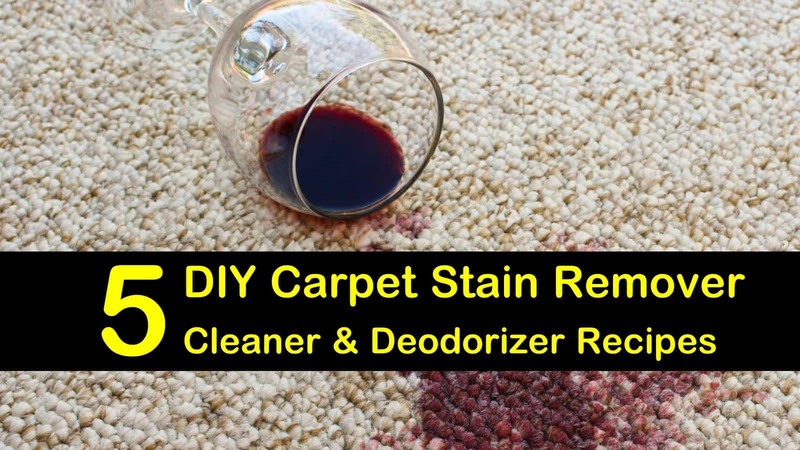 It’s inexpensive to make and will get rid of even the toughest stains, like red wine or pet stains. In a large spray bottle, combine the warm water and vinegar. Add the salt and essential oil of your choice. Place the cap on the bottle and shake. Liberally spray your carpet with the solution. Allow the carpets to dry. Vacuum the treated areas. For tough stains, like to get blood out of carpet or to remove tea stains from carpet, spray the solution directly on the stain and allow to dry. Vacuum the area. Repeat if needed. The carpet cleaning solution you use in your steam cleaner doesn’t have to be expensive. You can make a simple homemade carpet cleaner from the products you have in your kitchen and bathroom. Not only will you save money by making your own cleaner, but it will be less toxic than those you can purchase at the store. In your steam cleaning machine’s reservoir, mix the vinegar and the water. Clean your carpet by following the manufacturer’s instructions. The white vinegar will probably leave a slight smell for a couple of hours until it has dried. You can use several drops of essential oils in the solution to help make this method better smelling. When you have children, keeping your carpets clean is super important. Unfortunately, even with regular vacuuming, your carpet can begin to smell, especially in the winter when the house is closed up. This DIY carpet deodorizer recipe uses baking soda to soak up odors, leaving your carpet smelling fresh. In a mason jar, combine the soda and essential oil of your choice. Place the lid on the jar and shake well to combine. Remove the cover and replace the inner, metal lid with construction paper. Place the ring back on the jar and tighten. Cut off the excess construction paper. With a thin, sharp object, like a nail, poke holes in the construction paper. Shake the powder liberally onto your carpets. Let the deodorizer sit for 1 to 2 hours. Vacuum the carpet thoroughly. If you have carpet in your house, stains are inevitable, especially if you have kids or pets. To quickly get rid of spots in your carpet, you can make a simple spot remover from everyday household ingredients. Similar to our DIY homemade carpet shampoo, mix the ingredients in a spray bottle. Spray the stain with the solution and scrub the stain with a clean, dry washcloth. Using a fresh, dry towel blot the area dry. Before using this on your carpet, be sure to test the colorfastness of your carpet fibers by doing a quick spot test in an inconspicuous place. If you have tough spots like wine, chocolate or even mustard stains on the carpet, or you need a powerful car carpet cleaner, this homemade cleaning solution works great. The combination of the liquid dish soap and the hydrogen peroxide are excellent at removing tricky stains like grape juice and red wine. In a plastic spray bottle, simply mix the ingredients until combined and the baking soda is dissolved. Saturate the stain with the solution. Let it stand until the area is completely dry. Next, vacuum the area to pull up the residue. If the stain is especially tough, you can scrub the area with a soft-bristled brush before it has had a chance to dry. The next time your carpet needs to be cleaned, or you have a tough stain to get out, forget about calling the professional cleaning service and save yourself a ton of money. 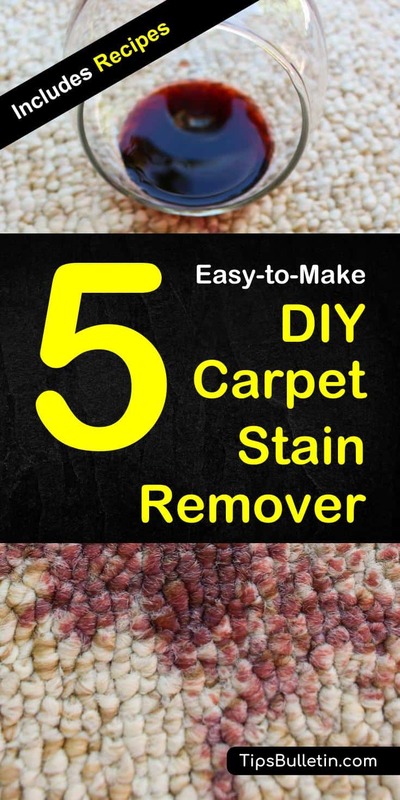 These DIY carpet stain remover recipes work just as well as the commercial carpet cleaners on the market and are less expensive because they use everyday products that you probably already have in your pantry and bathroom. The best part of these homemade carpet cleaning solutions is that they don’t contain any harsh chemicals, making them safe to use around your family and are safe for the environment. We hope that you found the information we presented to you in this article helpful. Please feel free to share this article with all your friends and family.